There are many mushroom supplements on the market claiming a variety of health benefits, and it is difficult to discern which of these claims are backed by reliable research. Most of the existing research is conducted using either human cells or animal models rather than human participants. Without being tested directly on humans, this research has limited application. A review of the literature reveals a relatively small number of studies have been conducted using human patients and those that do exist vary widely in study design and quality. This article brings together all the existing studies that involve human participants for three popular mushroom species that are commonly consumed as dietary supplements. The three species reviewed are Agaricus blazei or royal sun agaric, Inonotus obliquus or chaga, and Ganoderma lucidum or reishi. Each study described includes the study’s design, the condition being treated, the preparation, dosage, and duration of treatment, the number of subjects, and a summary of the results. The outcome of these studies is variable and caution is recommended when extrapolating the results. Many factors — such as poor study design, small sample sizes, lack of replication, mushroom variability, and problematic statistical methods — make it difficult to rely on the results of any individual study. Further research using well-designed clinical trials is needed to establish medicinal benefits for these three mushroom species. Mushrooms have long been used as medicine in cultures throughout the world. In recent years many species have become popular dietary supplements to promote health. For some mushrooms, a great deal of research on potential health benefits has been conducted, while for others there is very little scientific support. In spite of this, countless mushroom supplements are available on the market with preparations, doses, and health claims that vary widely between manufacturers. It is difficult to determine if the consumption of various mushroom supplements provides health benefits. Supplement companies often cite specific research to support their claims, but most of this has been conducted in vitro or using animal models, usually mice and rats. While this information can suggest possible value, there are differences in biochemical, physiological, and anatomical characteristics between animal models and humans. Caution is needed when extrapolating the results of this research to supplements prepared for human use. The number of studies of human subjects published in peer-reviewed literature is relatively small and variable (Leonard 2015). This review draws together all of the human clinical trials found in the peer-reviewed literature for three popular mushroom supplements. Each of these three mushrooms species is consumed for medicinal purposes, is widely obtainable, and is sold in dietary supplement form by multiple companies. While the included trials provide a succinct view of the research that has been conducted thus far, they do not indicate the reliability of the research. Many factors — such as study design, small sample sizes, lack of replication, mushroom variability, problematic statistical methods, and others — make it difficult to rely on the outcomes of the research. This paper is not designed to evaluate each individual study or to substantiate or refute the claims of any mushroom supplement companies, but rather to provide a view of the available research that has been conducted on human subjects. In this review, all the available human studies, including clinical, epidemiological, and case studies were assessed. All of the studies were found by searching the mushroom’s genus and species in Web of Science (1945–April 2015), BIOSIS (1980–April 2015), MEDLINE (up to April 2015), and clinicaltrials.gov (up to April 2015). Human studies referenced in review articles found after 2005 were also considered. Included studies were limited to those published in peer-reviewed journals and which involved at least ten subjects. Peer-review status was determined using Ulrichsweb (2015). The validity of the included publications was also assessed using Beall’s List of Predatory Open Access Publishers (2015). Studies where the intervention consisted of multiple ingredients, such as a combination of herbs and mushrooms rather than a single mushroom species, were excluded. No restrictions were placed on date, language, or study design. Where the article could not be read in its original form, the information was taken from a translation, a review article, or from the article abstract. When applicable, this is noted within the respective tables. Many of the claims made by supplement companies and included in this review are not medical terms and are taken directly from product labels or websites (Swanson Superior Herbs 2015; Myriad Mycology 2015; Mushroom Wisdom 2015; Terrasoul 2015). The information provided for each of the three species includes a description of the mushroom, its native range, some of its uses in folk medicine, claims from supplement companies, a brief summary of in vitro and in vivo animal research, and a table outlining the existing human studies. Each table includes the available information on study design, preparation, dosage, subjects, duration, and a summary of the results. Figure 1. Agaricus blazei, commonly known as the almond portobello mushroom. Reprinted from Wikimedia Commons, by H. Krisp, n.d., accessed September 23, 2015. Copyright 2013 CC BY-SA 3.0. Agaricus blazei is commonly consumed for medicinal purposes in both Brazil and Japan (Xu, Beelman, and Lambert 2012). Its flavor is characterized by an almond fragrance and a sweet taste. It is closely related to the white button mushroom, Agaricus bisporus, regularly eaten in the United States (Kerrigan 2005). In the wild, A. blazei is somewhat rare but has a wide distribution, growing throughout much the world. It has been assigned several scientific names in different regions — A. subrufescens, A. sylvaticus, A. rufotegulis, or A. brasiliensis — but all are now considered the same species (Kerrigan 2005). In Brazil, A. blazei has historically been used to fight physical and emotional stress, to stimulate the immune system, and to prevent or treat a variety of medical conditions such as diabetes, high cholesterol, osteoporosis, peptic ulcers, digestive problems, and cancer (Firenzuoli, Gori, & Lombardo 2008). Today, supplement companies advertise the benefits of A. blazei with claims that it “shows promise as anti-cancer and anti-tumor medicine” and provides “cellular-level immune system support” (Myriad Mycology “blazei”; Swanson Superior Herbs “blazei”). A. blazei is one of the more commonly researched medicinal mushrooms. A large number of in vitro studies have demonstrated a variety of effects including antitumor, antiviral, anti-inflammatory, antidiabetic, and anti-allergic properties (Wang, Fu, & Han 2013). In vivo animal research has displayed its ability to improve the efficacy of hepatitis B vaccines, stimulate immune response to leukemia, and promote T cell proliferation (Wang, Fu, & Han 2013). A. blazei contains several immunostimulatory compounds such as β-1, 3-D-glucans, glucomannan, and proteoglycans (El Enshasy & Hatti-Kaul 2013). Like the other mushrooms in this review, relatively few human studies for A. blazei have been documented in peer-reviewed journals. Table 1 lists those that meet the requirements for this review, 11 studies in all. In addition to those in Table 1, five clinical trials can be found on clinicaltrials.gov. The earliest began in 2005 and the latest in 2011. These trials tested the effects of A. blazei on patients with hepatitis C, multiple myeloma, inflammatory bowel disease, and type 2 diabetes mellitus. The results of two of the five trials can be found in Table 1 (Tangen et al. 2015; Hsu et al. 2007). The results of two were not located in the literature search, and the fifth trial exploring the effect of A. blazei treatment on inflammatory bowel disease is listed as currently recruiting patients (clinicaltrials.gov 2015). (5400 mg/day) 100 cancer patients with either cervical, ovarian, or endometrial cancer treated with chemotherapy; treatment (n = 39); control (n = 61) 9 wks Safety, Subjective and Physiological Effects: Natural killer cell activity in treated patients was significantly higher than non-treated patients. Fewer chemotherapy-associated side effects (such as lack of appetite, alopecia areata, general weakness) were reported in treated patients. HIV positive children received treatment (n = 10), compared with HIV negative children used as control (n = 14) 3 mos Physiological Effects: After supplementation, a reduction of thiobarbituric acid-reactive substances and nitrite and nitrate values and an increase in diphenyl-picrilhidrazil and Trolox equivalent antioxidant capacity values were observed in HIV-positive subjects. These results suggest that A. brasiliensis has potential as a complimentary treatment for HIV positive children. Fortes et al. 2009 colorectal cancer randomized, placebo-controlled, clinical trial A. sylvaticus 30 mg/kg of body weight/day 56 patients with colorectal cancer (stages I, II, and III); treatment (n=28), control (n=28) 6 mos Physiological Effects: Treated patients had significantly better results for hematological and immunological parameters and lower glycemia levels than the placebo group. Technology Co. Ltd., Taiwan) 3 capsules/day (1500 mg/day) 60 patients with type 2 diabetes; treatment (n = 29), control (n = 31) 12 wks Physiological Effects: The treatment group showed significantly lower insulin concentrations, and scored lower on the homeostasis model assessment for insulin resistance index. The plasma adiponectin concentration increased significantly in the treatment group but decreased among those taking the placebo. Insulin resistance improved among treated subjects with type 2 diabetes when compared with the placebo group. (quantity undetermined) 20 patients with chronic hepatitis C 12 wks Safety and Physiological Effects: A decreasing effect for serum γ-GTP activity was found in 80% of the patients, suggesting ABCL may be useful for patients with light hepatopathy such as C-type hepatitis. No toxicological findings or other side effects were observed. Lima et al. 2012 age randomized, double-blind, placebo-controlled clinical trial Gelatin capsules containing 300 mg A. blazei Murill dry extract were obtained from Estância Valemar (São Paulo, Brazil) 3 capsules/day (900 mg/day) 57 females; treatment (n = 28), control (n = 29) 60 days Physiological Effects: Body mass index, abdominal girth, body composition, blood pressure, and cytokine levels were measured. No changes from baseline were detectable for any parameter in either the treatment or placebo groups. 3 mos Physiological Effects: Group 1 was given a high dose and assessed for changes in liver function, renal function, and nutritional conditions. No statistically significant difference before and after administration, and no side effects caused by long-term administration were observed. Group 2 was measured for body weight, BMI, percentage body fat, percentage of visceral fat, blood cholesterol, neutral fat, and blood glucose and natural killer cell activity. There were statistically significant decreases in all of the indices after treatment, except natural killer cell activity, which increased. This suggests that the A. brasiliensis fruiting body may provide general health benefits. 3 packs/day 78 cancer survivors; group 1 (n = 30), group 2 (n = 24), group 3 (n = 24) 6 mos Safety: This trial was designed to assess the safety of Senseiro. The treatment did not cause problems in most patients at the dosages tested. Only 9 patients reported adverse effects, most were digestive in nature such as nausea and diarrhea, and 1 patient developed a liver dysfunction–related food allergy. 3 packs/day 67 cancer patients; group 1 (n = 23), group 2 (n = 22), group 3: (n = 22) 6 mos Subjective Effects: A before and after questionnaire was used to evaluate quality of life (QOL) among patients. The results showed a statistically significant improvement in QOL in both physical and mental components. Males improved more in physical components, while females improved only mental components. Ages 65 and under improved mental components, while ages 66 and older improved physical components. Optimal dose effects occurred at 2 packs/day. Tangen et al. 2015 multiple myeloma randomized, double-blind, placebo-controlled clinical trial AndoSan extract, containing 82% of A. blazei Murill 60 ml/day 40 patients with multiple myeloma, treatment (n = 19), control (n = 21) 7 wks (approx.) Physiological Effects: No statistically significant clinical impact of AndoSan was detected. (5400 mg/day) 32 prostate cancer patients following radical prostatectomy 6 mos Safety and Physiological Effects: There was no response in terms of prostate-specific antigen. No statistically significant anticancer activity and no serious adverse effects were observed. Figure 2. Inonotus obliquus, commonly known as birch fungus. Reprinted from Wikimedia Commons, by H. Baker, n.d., accessed September 23, 2015. Copyright 2011 CC BY-SA 3.0. Inonotus obliquus is a polypore mushroom that grows as a plant pathogen on the trunk of birch trees in northern latitudes throughout the world (El Enshasy & Hatti-Kaul 2013). According to systematic classification methods, I. obliquus is also known as birch fungus, Fungus betulinus. I. obliquus can only be collected from living or freshly cut, mature birch trees. On dry standing or fallen trees, the mushroom dies, and the content of active compounds decreases dramatically (Shashkina, Shashkin, & Sergeev 2006). The Tartars of West Siberia traditionally used I. obliquus to treat “tuberculosis, gastrosia, liver diseases, heart diseases, and ascariasis” (Zhong et al. 2013). It is currently used to treat various disorders including gastrointestinal cancer, as well as cardiovascular disease and diabetes in Russia, Poland, and most of the Baltic countries (Zhong et al. 2013). Supplement companies that sell I. obliquus in the United States claim that it has demonstrated “a variety of beneficial cardiovascular actions and immune supporting benefits” and that it is “currently being used in numerous cancer studies” and “being studied for its ability to treat the virus HIV” (Mushroom Wisdom “chaga”; Myriad Mycology “chaga”). I. obliquus has a high content of compounds such as β-glucans that may affect the immune system, (El Enshasy & Hatti-Kaul 2013) and secondary metabolites, including phenolic compounds, melanins, and lanostane-type triterpenoids (Zhong et al. 2013). Despite the small number of human studies, in vitro and in vivo animal studies have been extensive. I. obliquus has exhibited anticancer activity in various types of tumor cells. In vitro studies have demonstrated antiviral effects, platelet aggregation inhibitory activities, and anti-inflammatory and analgesic properties (Zhong et al. 2013). In vivo, antitumor activity, antioxidant activity, and an increase in hypoglycemic activity have all been demonstrated in mice (Zhong et al. 2013). Although there is widespread use in Russia (Zhong et al. 2013), only two human studies were found in the peer-reviewed literature, and both are over 30 years old, as seen in Table 2. No controlled studies designed to assess the safety of I. obliquus were found and no studies were reported on clinicaltrials.gov (2015). Like many mushroom supplements, most of the evidence for safety and efficacy appear to be based on I. obliquus's long traditional use. group 3: >2 yrs Outcome of Treatment: Complete disappearance of psoriatic eruptions were observed in 38 patients and considerable improvement in 8 patients. No therapeutic effect was achieved in 4 patients. Gastrointestinal tract symptoms were modified or disappeared completely. A less significant effect was observed in patients with diseases of the ears, nose, and throat, those abusing alcohol, and those having significant long-term nutrition disorders. 90 ml/day 58 patients with peptic ulcers 24 days, results assessed for an additional 2 wks Subjective Effects and Outcome of Treatment: The therapeutic effect of Befungin was connected with a decrease in pain caused by peptic ulcers. The effect increased with higher doses. After treatment ceased, pain returned to normal levels. Figure 3. Ganoderma lucidum, commonly known as spirit plant. Reprinted from Wikimedia Commons, by E. Steinert, n.d., accessed September 23, 2015, http://commons.wikimedia.org/wiki/File:Ganoderma_lucidum_02.jpg. Copyright 2005 CC BY-SA 2.5-2.0-1.0. 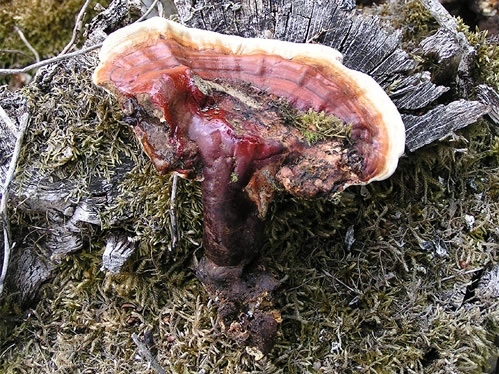 Ganoderma lucidum can be found growing on plum trees throughout Asia and in other parts of the world. It has a long history of use in Japanese and Chinese traditional medicine to “increase energy, stimulate the immune system, and promote health and longevity” (Chang & Buswell 1999). Modern uses of G. lucidum include treatment for coronary heart disease, arteriosclerosis, hepatitis, arthritis, nephritis, bronchitis, hypertension, cancer, and gastric ulcers (Boh 2007). Claims from supplement companies include its use in treating “insomnia, allergies, liver disease, anxiety, rheumatoid arthritis, and various forms of cancer” as well as its ability to “build resistance to illness, detox the body, and calm the nerves” (Myriad Mycology “reishi”; Terrasoul “reishi”). Not only is G. lucidum one of the most frequently consumed dietary supplements, it is one of the most well-researched mushrooms. A wide range of in vitro and in vivo animal studies have been conducted to investigate the various health benefits of G. lucidum. These have provided evidence to suggest it has the potential to reduce the immunosuppressive response induced by anticancer drugs and abate autoimmune diseases. G. lucidum has also demonstrated anti-inflammatory, antidiabetic, antiviral, and antibacterial activity both in vivo and in vitro (Boh et al. 2013). This mushroom contains more than 50 types of polysaccharides and peptide-polysaccharides complexes in addition to about 120 bioactive compounds (El Enshasy & Hatti-Kaul 2013). Many of the clinical trials for G. lucidum were designed to test its adjuvant use in cancer therapy although a variety of other conditions have also been studied. Twenty-six studies met the requirements of this review and are included in Table 3. Four additional trials involving the treatment of Parkinson’s disease, rheumatoid arthritis, and pediatric cancer were found on clinicaltrials.gov. One of these trials was not located in the literature search, and two did not meet the review criteria (Shing et al. 2008; Li et al. 2007). The fourth trial looking at the effect of G. lucidum on patients with head and neck cancer is currently recruiting patients (clinicaltrials.gov 2015). Chen et al. 2006 advanced colorectal cancer open-label clinical trial (no randomization, blinding, or placebo-control) Ganopoly, 1 capsule = 600 mg extract equivalent to 9 g of fruiting body (provided by Encore International Co., Auckland, NZ) 5.4 g/day 41 patients with advanced colorectal cancer 12 wks Physiological Effects: When compared to pre-treatment levels, no statistically significant improvement was observed for the following indices: Lymphocyte mitogenic reactivity to phytohemagglutinin, T lymphocytes counts for the surface molecules CD3, CD4, CD8 and CD56, and natural killer cell activity. 2 times/day (1440 mg/day) 26 patients with borderline elevations of blood pressure and/or cholesterol 12 wks; placebo and crossover switch at 4 wks Physiological Effects: Plasma insulin and homeostasis model assessment-insulin resistance were lower in the treatment group than in the placebo group..
Fu & Wang 1982 atrophic myotonia preliminary, open label study (no randomization, blinding, or placebo-control) Ganoderma, an injection of a water soluble preparation of G. lucidum spores (Institute of Materia Medica) 400 mg/day 10 patients with atrophic myotonia unspecified, at least 2 wks; patients were followed after treatment for an average of 5.2 yrs Safety and Subjective Effects: Sleep, appetite, and physical strength improved among the patients after 2 weeks. Five reported marked improvement, 2 reported improvement, and 3 reported slight improvement in muscle strength with mytonic symptoms relieved. Six patients displayed at least some long-term results. control (n = 36) 12 wks Safety and Physiological Effects: A statistically significant decrease in glycosylated hemoglobin was observed in the treated group in comparison with the control group. The results suggest that Ganopoly is efficacious and safe in lowering blood glucose concentrations. control (n = 82) 12 wks Safety and Physiological Effects: Treatment improved primary symptoms, decreased abnormal electrocardiogram appearance, and decreased blood pressure and cholesterol in comparison to the control group. control (n = 26) 12 wks treatment and 12 wks follow-up Safety and Physiological Effects: A decreased level of hepatitis B virus DNA and hepatitis B e-antigens occurred in 25% of the treatment group vs. 4% of the control group. The number of treated patients with normal aminotransferase values was 33% and 13% had cleared hepatitis B surface antigens vs. 0% of control patients. Results indicate that Ganopoly is well tolerated and appears to be active against HBV in patients with chronic hepatitis B.
control (n = 31) 12 wks Safety, Subjective and Physiological Effects: The number of treated patients with stabilized cancer at 12 weeks was 35.1% vs. 22.6% of control patients. Treatment resulted in a statistically significant increase in Karnofsky performance scores (a method of measuring patients' performance of daily living activities) in 50% vs. 14.3% in the control group. Immune responses were significantly increased in treated patients but not control patients. 3 times/day before meals (5400 mg/day) 143 patients with advanced, previously treated cancer 12 wks Safety and Physiological Effects: There were 32 patients in stable condition for at least 12 weeks. Of these, there was a statistically significant increase in lymphocyte myogenic reactivity and natural killer cell activity. Ganopoly may have an adjunct role in the treatment of patients with advanced cancer. 3 times/day before meals (5400 mg/day) 34 patients with advanced stage cancer (lung, breast, brain, liver, colon, prostate, bladder) 12 wks Physiological Effects: Compared to baseline, a statistically significant increase in T cell populations and natural killer cell activity was measured at 12 weeks. 3 times/day before meals (5400 mg/day) 30 lung cancer patients 12 wks Physiological Effects: No statistically significant improvement was observed for the following indices: Lymphocyte mitogenic reactivity to phytohemagglutinin, T lymphocytes counts for the surface molecules CD3, CD4, CD8 and CD56, the mean plasma concentrations of interleukin (IL)-2, IL-6, and interferon (IFN), and natural killer cell activity. control (n = 61) 8 wks Safety, Subjective and Physiological Effects: Ganopoly was well tolerated in the study patients and there were statistically significant improvements in the CGI severity, sense of fatigue, and sense of well-being (symptoms in neurasthenia) scores in the treatment group compared with the control. 3 times/day before meals (5400 mg/day) 47 patients with advanced colorectal cancer 12 wks Physiological Effects: No statistical significance was observed in mitogenic reactivity to phytohemagglutinin when a compared to baseline values and those after 12-weeks of treatment. control (n = 14) 4 wks Physiological Effects: The treatment group had a statistically significant drop in systolic and diastolic blood pressure plus a statistically significant change in nail fold microcirculation compared to the control group. Improvements in capillary loop density, diameter, and red blood cell velocity were also observed. The results indicate G. lucidum may contribute to prevention and reversion of target organ deterioration in hypertension. group 2: mild–no hypertension 6 mos Physiological Effects and Outcome of Treatment: G. lucidum had a statistically significant blood-pressure lowering effect on group 1 patients with essential hypertension, but no effect on group 2 patients with essential or borderline hypertension. control (n = 20) 4 wks treatment and 4 wks follow-up Safety: G. lucidum was not associated with gross impairment of platelet and global hemostatic function and did not increase the risk of bleeding in healthy individuals. control: (n = 12) 8 wks Safety and Physiological Effects: There were no statistically significant differences in baseline characteristics for age, PSA level, prostate volume, peak urinary flow rate, or symptom score among the treatment groups vs. control; however, the treatment groups receiving 6 mg and 60 mg had significantly improved International Prostate Symptom Scores. No major adverse effects were observed. control (n = 44) 12 wks Safety and Physiological Effects: There was a statistically significant improvement in the International Prostate Symptom Score in the treatment group vs. control. Overall treatment was well tolerated with no severe adverse effects. control (n = 102) 12 mos Physiological Effects and Outcome of Treatment: The number and size of adenomas significantly decreased in the treatment group and increased in the control group. 1440 mg equivalent to 13.2 g of fresh mushroom (Vitagreen Co Ltd Hong Kong) 4 capsules/day (1440 mg/day) 18 healthy adults 4 wks Physiological Effects: No statistically significant change in antioxidant status, coronary heart disease risk, DNA damage, immune status, inflammation, or markers of liver and renal toxicity were found. 720 mg equivalent of 6600 mg of fresh mushroom (Vitagreen Co Ltd Hong Kong) 2 capsules/day (720 mg/day) 10 healthy volunteers 10 days Safety and Physiological Effects: There was no statistically significant difference in a-tocopherol concentrations, urine antioxidant capacity, fasting plasma ascorbic acid, erythrocyte superoxide dismutase and glutathione peroxidase activities, plasma lipids, or uric acid during the treatment period. There was an increase in acute plasma antioxidant capacity. No deleterious effects were measured. Results indicate that G. lucidum is safe for healthy adults. 3 times/day (3000 mg/day) 50 outpatients with type 2 diabetes; (unable to determine treatment number) 12 wks Physiological Effects: Results for post-prandial glucose levels after treatment were mixed. At 2 hours there was a statistically significant reduction for those taking placebo compared to the treatment group. However, at 4 hours, the treatment group displayed a statistically significant drop when compared to the control. According to the systematic review (Klupp et al. 2014), the evidence in this study did not support the use of G. lucidum for treatment of type 2 diabetes. control (n = 8) 10 days Safety: No adverse effects were observed in the treatment group following intake. Xiao, Liu, & Chen 2003 mushroom poisoning clinical trial (no randomization, blinding, or placebo-control) G. lucidum, 1000 mg decocted with water to 600 ml Single dose (taken in conjunction with conventional treatment) 14 patients suffering from poisoning by Russula subnigricans compared to 11 patients treated with conventional treatment alone. assessed after single dose Physiological Effects: Decreased urinary protein and red blood cell count as well as other improved markers of kidney injury were observed in the treated group. (quantity undetermined) 3 packs/day 15 prostate cancer patients following radical prostatectomy 6 mos Safety and Physiological Effects: There was no response in terms of prostate-specific antigen. No statistically significant anticancer activity and no serious adverse effects were observed. 20 capsules/day 40 male football players assigned to four groups: control, group 1, group 2, group 3. The three treatment groups stayed in normobaric hypoxic rooms for 28 days. All four groups trained together at sea level. 6 wks Physiological Effects: There were no statistically significant differences and changes in T lymphocyte subsets between groups 1 and 2, but in group 3 the percentage of T lymphocytes surface molecules CD3+ and CD4+ increased significantly. This suggests that the ingestion of G. lucidum at levels of 20 capsules a day could have a beneficial effect on T lymphocyte levels in elevation training. control (n = 23) 4 wks Safety and Subjective Effects: The treatment group reported statistically significant improvements in physical well-being and fatigue after intervention. They also reported less anxiety and depression and better quality of life. No serious adverse effects occurred during the study. While there is value in combining the available clinical trials for these three mushroom species, it is important to address the difficulties involved in evaluating this kind of research. Many factors make it challenging to ascertain the health benefits of mushroom supplements. First, there are a number of different purposes for conducting clinical trials. Some of the studies included in this review were designed to assess the safety and side effects of mushroom consumption. Others measured specific physiological effects such as natural killer cells activity or plasma insulin levels (Ahn et al. 2004; Chu et al. 2012). Several used patient reporting methods to measure subjective effects such as pain or quality of life (Fu & Wang 1982; Zhao et al. 2012). A small number were designed to measure the outcome of treatment for a specific disease (Oka et al. 2010; Dosychev & Bystrova 1973). Each of these end results provides useful information for further research, but none are designed to provide conclusive evidence. For example, phase I clinical trials, sometimes called preliminary or pilot studies, like Zhao et al. (2013) or Ohno et al. (2011), are generally designed to evaluate a treatment’s safety, establish a dosage range, and identify side effects (clinicaltrials.gov 2015). This information is used to determine if further research can safely be conducted. Twelve of the 39 clinical trials included in this review were specifically designated as phase I, pilot, or preliminary trials, although at least five others reported information on safety and side effects. Variations in study design also affect how results are evaluated. Open label studies, such as Yoshimura et al. (2010), are structured so that both the patients and investigators are aware of the treatment the patient is receiving (clinicaltrials.gov 2015). These studies do not control for human bias, so while they may indicate the potential benefit for further research, they don’t provide stand-alone evidence. Double-blinded studies, where neither the patients nor the investigator know if the patient is receiving the test substance or a placebo, are needed to support the results. Only 13 of the 39 trials in this review were double-blinded. Other design characteristics, such randomization and placebo controls, are needed to achieve reliable results. Both were present in only 21 of the included studies. Sample sizes also impact the evaluations of results. Small sample sizes make it difficult to determine the likelihood that the results are statistically significant. This commonly produces publications with falsely positive results (Reinhart 2015, pp. 23–28). Only four of the studies in this review had sample sizes with 100 or more patients. Another challenge that arises while evaluating a body of research is the strong incentive among researchers to publish studies with positive results. Because there is no general standardization for data analysis in clinical trials, it is common for researchers to choose those statistical methods that provide a statistically significant outcome. While this is not necessarily intentional, it does tend to produce results that appear more favorable to a researcher’s hypothesis than the data may warrant (Reinhart 2015, pp. 4–5). Conversely, there is often an inability or lack of incentive to publish negative results. Journals looking for impactful research may be less likely to publish a study that shows no measurable benefit for mushroom consumption (Reinhart 2015, pp. 24–25). Researchers also may abandon a study that shows no effect in pursuit of other, more promising, research. Or, they may measure a number of indices during treatment but choose to publish only those indices that show statistical significance. As a result, the body of available research is generally skewed toward studies that show a positive effect. There were 36 trials in this review that measured indices beyond side effects; 25 of these reported positive effects with treatment. Of those completed studies that were reported on clinicaltrials.gov, three of seven were not found during the literature search. While the reason these three trials were not published was not determined, it does call into question the cause for a lack of publication or for further research on the topic. There is, in fact, a noteworthy lack of follow-up research among all of the included trials. Only three authors appear to have conducted further research (Wachtel-Galor et al. 2004b; Noguchi et al. 2008b; Gao et al. 2003b; 2005a). It would seem likely that promising results would elicit further study, and the absence of further research raises some doubt about the ability to replicate positive results. Another concern is the source of motivation for the research. It is not always easy to determine if research is funded in whole or in part by organizations with an incentive to find positive results. Because many of the included studies are testing the effectiveness of a specific brand of dietary supplement, such as Ganopoly or Senseiro, it is possible that there is an incentive to establish evidence for the health benefits of these products (Gao et al. 2002a; Ohno et al. 2013). This lack of objectivity can have an effect on the validity of even well-designed research (Jagsi et al. 2009). Where reliable research methods are used, mushrooms produced as dietary supplements still lack standards for cultivation and preparation, as well as testing protocols needed to guarantee product quality (Sullivan, Smith, & Rowan 2006). The bioactivity of mushrooms can vary widely depending on the strain, growing conditions, developmental stages, and the parts of the mushroom that are consumed (Borchers et al. 2008). Extraction methods such as water temperature or ethanol concentration can also impact the bioactivity of the resulting product (Borchers et al. 2008). Even when these variables are carefully recorded and disclosed, the study results for a particular treatment cannot always be extrapolated to the general consumption of a mushroom species. Finally, there are few regulations for dietary supplements that are sold in the United States. Clinical studies are not a requirement, and the active ingredients of many commercial mushroom products are not known. As a result, adulteration with other species is common (Wasser 2011). This provides another challenge to both consumers and health professionals when determining the effectiveness and safety of consuming these products. The human trials included in this review vary greatly with regard to study design, preparation, dosage, and number of subjects, as well as the analysis and reporting of results. While many show interesting possibilities for the use of these three mushroom species in treating a variety of medical conditions, additional research using well-designed clinical studies and reliable statistical methods is still needed. Further double-blinded, placebo-controlled studies with large trial populations and well-standardized preparations are necessary to reliably establish the efficacy of these mushrooms as dietary supplements. Ahn, W. S., D. J. Kim, G. T. Chae, J. M. Lee, S. M. Bae, J. I. Sin, Y. W. Kim, S. E. Namkoong, & I. P. Lee. 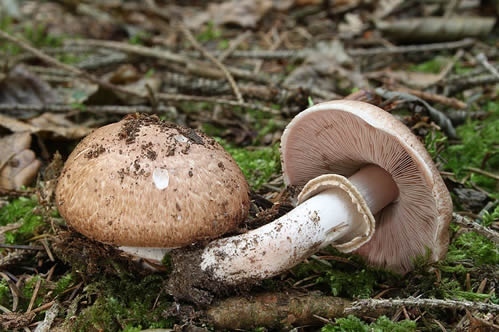 "Natural killer cell activity and quality of life were improved by consumption of a mushroom extract, Agaricus blazei Murill Kyowa, in gynecological cancer patients undergoing chemotherapy." International Journal of Gynecological Cancer 14, no. 4 (2004): 589-594. doi: 10.1111/j.1048-891X.2004.14403.x. Boh B., M. Berovic, J. Zhang, & L. Zhi-Bin. “Ganoderma lucidum and its pharmaceutically active compounds.” Biotechnology Annual Review 13 (2007): 265-301. Borchers, A. T., A. Krishnamurthy, C. L. Keen, F. J. Meyers, & M. E. Gershwin. “The immunobiology of mushrooms.” Experimental Biology and Medicine 233, no. 3 (2008): 259-276. doi:10.3181/0708-mr-227. Chang S.T. & J. A. Buswell. “Ganoderma lucidum - a mushrooming medicinal mushroom”. International Journal of Medicinal Mushrooms 1 (1999): 139-46. Chen, X., Z. P. Hu, X. X. Yang, M. Huang, Y. Gao, W. Tang, S. Y. Chan, X. Dai, J. Ye, P. C. Ho, W. Duan, H. Y. Yang, Y. Z. Zhu, & S. F. Zhou. "Monitoring of immune responses to a herbal immuno-modulator in patients with advanced colorectal cancer." International Immunopharmacology 6, no. 3 (2006): 499-508. doi: 10.1016/j.intimp.2005.08.026. Chu, T. T., I. F. Benzie, C. W. Lam, B. S. Fok, K. K. Lee, & B. Tomlinson. "Study of potential cardioprotective effects of Ganoderma lucidum (Lingzhi): results of a controlled human intervention trial." The British Journal of Nutrition 107, no. 7 (2012): 1017-27. doi: 10.1017/s0007114511003795. Dosychev, E. A., & V. N. Bystrova. 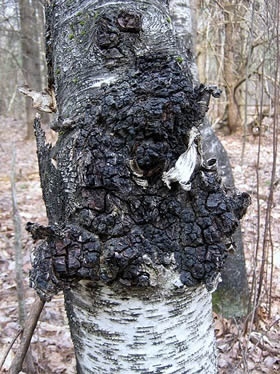 "Treatment of psoriasis using "Chaga" fungus preparations." Vestnik Dermatologii i Venerologii 47, no. 5 (1973): 79-83. El Enshasy, H. A., & R. Hatti-Kaul. "Mushroom immunomodulators: unique molecules with unlimited applications." Trends in Biotechnology 31, no.12 (2013): 668-677. doi: 10.1016/j.tibtech.2013.09.003. Fedotov, A. A., & I. R. Yu. "Effect of Befungin on the central nervous system in patients with peptic ulcers." Klinicheskaya Meditsina (Moscow) 59, no. 7 (1981): 22-25. Figueira, M. S., L. A. Sa, A. S. Vasconcelos, D. R. Moreira, P. S. O. C. Laurindo, D. R. G. Ribeiro, R. S. Santos, P. Guzzo, M. F. Dolabela, & S. Percario. "Nutritional supplementation with the mushroom Agaricus sylvaticus reduces oxidative stress in children with HIV." Canadian Journal of Infectious Diseases & Medical Microbiology 25, no.5 (2014): 257-264. Fortes, R. C., M. R. C. G. Novaes, V. L. Recova, & A. L. Melo. "Immunological, hematological, and glycemia effects of dietary supplementation with Agaricus sylvaticus on patients' colorectal cancer." Experimental Biology and Medicine 234, no. 1 (2009): 53-62. doi: 10.3181/0806-rm-193. Fu, H., & Z. Wang. "The clinical effects of ganoderma lucidium spore preperations in 10 cases of atrophic myotonia." Journal of Traditional Chinese Medicine 2, no. 1 (1982): 63-65. Gao, Y. H., H. Gao, E. Chan, W. B. Tang, X. T. Li, J. Liang, & S. F. Zhou. "Protective effect of Ganoderma (a mushroom with medicinal properties) against various liver injuries." Food Reviews International 21, no.1 (2005b): 27-52. doi: 10.1081/fri-200040586. Gao, Y. H., W. B. Tang, X. H. Dai, H. Gao, G. L. Chen, J. X. Ye, E. Chan, H. L. Koh, X. T. Li, & S. F. Zhou. "Effects of water-soluble Ganoderma lucidum polysaccharides on the immune functions of patients with advanced lung cancer." Journal of Medicinal Food 8, no. 2 (2005a): 159-168. doi: 10.1089/jmf.2005.8.159. Gao, Y., S. Zhou, W. Jiang, M. Huang, & X. Dai. "Effects of Ganopoly (a Ganoderma lucidum polysaccharide extract) on the immune functions in advanced-stage cancer patients." Immunological Investigations 32, no. 3 (2003b): 201-15. Gao, Y., G. Chen, X. Dai, J. Ye, & S. Zhou. "A phase I/II study of Ling Zhi mushroom Ganoderma lucidum (W.Curt.:Fr.) Lloyd (Aphyllophoromycetideae) extract in patients with coronary heart disease." International Journal of Medicinal Mushrooms 6, no. 4 (2004b): 327-334. doi: 10.1615/IntJMedMushr.v6.i4.30. Gao, Y., X. Dai, G. Chen, J. Ye, & S. Zhou. "A randomized, placebo-controlled, multicenter study of Ganoderma lucidum (W.Curt.:Fr.) Loyd (Aphyllophoromycetideae) polysaccharides (Ganopoly(R)) in patients with advanced lung cancer." International Journal of Medicinal Mushrooms 5, no. 4 (2003a): 369-381. doi: 10.1615/InterJMedicMush.v5.i4.40. Gao, Y., J. Lan, X. Dai, J. Ye, & S. Zhou. "A phase I/II study of ling zhi mushroom Ganoderma lucidum (W.Curt.:Fr.) Loyd (Aphyllophoromycetideae) extract in patients with type II diabetes mellitus." International Journal of Medicinal Mushrooms 6, no. 1 (2004a): 33-39. doi: 10.1615/IntJMedMushr.v6.i1.30. Gao, Y., W. Tang, X. Dai, H. Gao, G. Chen, J. Ye, E. Chan, M. Huang, and S. Zhou. "Immune responses to water-soluble Ling Zhi mushroom Ganoderma lucidum (W. Curt. : Fr.) P. Karst. Polysaccharides in patients with advanced colorectal cancer." International Journal of Medicinal Mushrooms 7, no. 4 (2005c): 525-537. Gao, Y., S. Zhou, G. Chen, X. Dai, & J. Ye. "A phase I/II study of a Ganoderma lucidum (Curt. : Fr.) P. Karst. extract (Ganopoly) in patients with advanced cancer." International Journal of Medicinal Mushrooms 4, no. 3 (2002b): 207-214. Gao, Y., S. Zhou, G. Chen, X. Dai, J. Ye, & H. Gao. "A phase I/II study of a Ganoderma lucidum (Curt. : Fr.) P Karst. (Ling Zhi, Reishi mushroom) extract in patients with chronic hepatitis B." International Journal of Medicinal Mushrooms 4, no. 4 (2002a): 321-327. Hsu, C. H., Y. L. Liao, S. C. Lin, K. C. Hwang, & P. Chou. "The mushroom Agaricus blazei Murill in combination with metformin and gliclazide improves insulin resistance in type 2 diabetes: A randomized, double-blinded, and placebo-controlled clinical trial." Journal of Alternative and Complementary Medicine 13, no.1 (2007): 97-102. doi: 10.1089/acm.2006.6054. Inuzuka, H. "Clinical utility of ABCL (Agalicus Mushroom Extract) treatment for C-type hepatitis." Japanese Pharmacology and Therapeutics 30, no. 2 (2002): 103-110. Jagsi, R., , N. Sheets, , A. Jankovic, , A. R. Motomura, , S. Amarnath, &, P. A. Ubel "Frequency, Nature, Effects, and Correlates of Conflicts of Interest in Published Clinical Cancer Research." Cancer 115, no. 12 (2009): 2783-2791. doi:10.1002/cncr.24315. Jin, H., G. Zhang, X. Cao, M. Zhang, J. Long, B. Luo, H. Chen, S. Qian, M. Mori, & Z. Wang. "Treatment of hypertension by Linzhi combined with hypotensor and its effects on arterial, arteriolar and capillary pressure and microcirculation." International Congress Series; Microcirculatory approach to Asian traditional medicine: Strategy for the scientific evaluation, edited by H. Niimi, R. J. Xiu, T. Sawada and C. Zheng, (1996): 131-138. Jin, X., R. J. Beguerie, D. M. Y. Sze, & G. C. F. Chan. “Ganoderma lucidum (Reishi mushroom) for cancer treatment.” Cochrane Database of Systematic Reviews 6 (2012). doi:10.1002/14651858.CD007731.pub2. Kanmatsuse, K., N. Kajiwara, K. Hayashi, S. Shimogaichi, I. Fukinbara, H. Ishikawa, & T. Tamura. "Studies on ganoderma lucidium efficacy against hypertentsion and side effects." Yakugaku Zasshi-Journal of the Pharmaceutical Society of Japan 105, no. 10 (1985): 942-947. Kerrigan, R. W. "Agaricus subrufescens, a cultivated edible and medicinal mushroom, and its synonyms." Mycologia 97, no. 1 (2005) :12-24. doi: 10.3852/mycologia.97.1.12. Klupp, N. L., D. Chang, F. Hawke, H. Kiat, H. Cao, S. J. Grant, & A. Bensoussan. "Ganoderma lucidum mushroom for the treatment of cardiovascular risk factors." The Cochrane Database of Systematic Reviews 2 (2015): CD007259-CD007259. doi: 10.1002/14651858.CD007259.pub2. Kwok, Y., K. F. Ng, C. C. Li, C. C. Lam, & R. Y. Man. "A prospective, randomized, double-blind, placebo-controlled study of the platelet and global hemostatic effects of Ganoderma lucidum (Ling-Zhi) in healthy volunteers." Anesthesia and Analgesia 101, no. 2 (2005): 423-426. doi: 10.1213/01.ane.0000155286.20467.28. Lima, C., V. C. Souza, M. C. Morita, M. D. Chiarello, & M. G. de Oliveira Karnikowski. "Agaricus blazei Murrill and inflammatory mediators in elderly women: a randomized clinical trial." Scandinavian Journal of Immunology 75, no. 3 (2012): 336-341. Li, E. K., L.-S. Tam, C. K. Wong, W. C. Li, C. W. K. Lam, S. Wachtel-Galor, . . . B. Tomlinson. "Safety and efficacy of Ganoderma lucidum (Lingzhi) and San miao San supplementation in patients with rheumatoid arthritis: A double-blind, randomized, placebo-controlled pilot trial." Arthritis & Rheumatism-Arthritis Care & Research 57, no. 7(2007):1143-1150. doi:10.1002/art.22994. Liu, Y., Y. Fukuwatari, K. Okumura, K. Takeda, K. Ishibashi, M. Furukawa, N. Ohno, K. Mori, M. Gao, & M. Motoi. "Immunomodulating activity of Agaricus brasiliensis KA21 in mice and in human volunteers." Evidence-Based Complementary and Alternative Medicine 5, no. 2 (2008): 205-219. Noguchi, M., T. Kakuma, K. Tomiyasu, Y. Kurita, H. Kukihara, F. Konishi, S. Kumamoto, K. Shimizu, R. Kondo, & K. Matsuoka. "Effect of an extract of Ganoderma lucidum in men with lower urinary tract symptoms: a double-blind, placebo-controlled randomized and dose-ranging study." Asian Journal of Andrology 10, no. 4 (2008a): 651-8. doi: 10.1111/j.1745-7262.2008.00336.x. Noguchi, M., T. Kakuma, K. Tomiyasu, A. Yamada, K. Itoh, F. Konishi, S. Kumamoto, K. Shimizu, R. Kondo, & K. Matsuoka. "Randomized clinical trial of an ethanol extract of Ganoderma lucidum in men with lower urinary tract symptoms." Asian Journal of Andrology 10, no.5 (2008b): 777-85. doi: 10.1111/j.1745-7262.2008.00361.x. Ohno, S., Y. Agaricus blazei Sumiyoshi, K. Hashine, A. Shirato, S. Kyo, & M. Inoue. "Phase I clinical study of the dietary supplement, Murill, in cancer patients in remission." Evidence-Based Complementary and Alternative Medicine (2011): 1-9. doi: 10.1155/2011/192381. Ohno, S., Y. Sumiyoshi, K. Hashine, A. Shirato, S. Kyo, & M. Inoue. "Quality of life improvements among cancer patients in remission following the consumption of Agaricus blazei Murill mushroom extract." Complementary Therapies in Medicine 21, no. 5 (2013): 460-467. Oka, S., S. Tanaka, S. Yoshida, T. Hiyama, Y. Ueno, M. Ito, Y. Kitadai, M. Yoshihara, & K. Chayama. "A water-soluble extract from culture medium of Ganoderma lucidum mycelia suppresses the development of colorectal adenomas." Hiroshima Journal of Medical Sciences 59, no. 1 (2010): 1-6. Reinhart, A. “Statistics Done Wrong” (2015). San Francisco: No Starch Press Inc.
Shashkina, M. Ya, P. N. Shashkin, & A. V. Sergeev. "Chemical and medicobiological properties of chaga (review)." Pharmaceutical Chemistry Journal 40, no. 10 (2006): 560-568. doi: 10.1007/s11094-006-0194-4. Shing, M., T. Leung, Y. Chu, C. Li, K. Chik, P. Leung, . . .C. Li. "Randomized, double-blind and placebo-controlled study of the immunomodulatory effects of Lingzhi in children with cancers." Paper presented at the ASCO Annual Meeting Proceedings. (2008). Sullivan, R., J. E. Smith, & N. J. Rowan. "Medicinal mushrooms and cancer therapy - translating a traditional practice into Western medicine." Perspectives in Biology and Medicine 49, no. 2 (2006): 159-170. doi: 10.1353/pbm.2006.0034. Tangen, J., A. Tierens, J. Caers, M. Binsfeld, O. K. Olstad, A. S. Troseid, J. Wang, G. E. Tjonnfjord, & G. Hetland. "Immunomodulatory effects of the Agaricus blazei Murrill-based mushroom extract AndoSan in patients with multiple myeloma undergoing high dose chemotherapy and autologous stem cell transplantation: a randomized, double blinded clinical study." BioMed Research International. (2015). doi: 10.1155/2015/718539. Ulrichsweb. (Retrieved 2015). ProQuest LLC. https://ulrichsweb.serialssolutions.com. Wachtel-Galor, S., Y. T. Szeto, B. Tomlinson, & I. F. Benzie. "Ganoderma lucidum ('Lingzhi'); acute and short-term biomarker response to supplementation." International Journal of Food Sciences and Nutrition 55, no. 1 (2004a): 75-83. doi: 10.1080/09637480310001642510. Wachtel-Galor, S., B. Tomlinson, & I. F. Benzie. "Ganoderma lucidum ("Lingzhi"), a Chinese medicinal mushroom: biomarker responses in a controlled human supplementation study.” The British Journal of Nutrition 91, no. 2 (2004b): 263-9. doi: 10.1079/bjn20041039. Wang, H., Z. Fu, & C. Han. "The Medicinal values of culinary-medicinal royal sun mushroom (Agaricus blazei Murrill)." Evidence-Based Complementary and Alternative Medicine (2013): 842619-842619. doi: 10.1155/2013/842619. Wang C. W., J. S. M. Tschen, & W.H. H. Sheu. “Ganoderma lucidum on metabolic control in type 2 diabetes subjects - a double blinded placebo control study.” Journal of Internal Medicine of Taiwan 19 (2008): 54-60. Wasser, S. P. "Current findings, future trends, and unsolved problems in studies of medicinal mushrooms." Applied Microbiology and Biotechnology 89, no. 5 (2011): 1323-1332. doi: 10.1007/s00253-010-3067-4. Wicks, S. M., R. Tong, C. Z. Wang, M. O'Connor, T. Karrison, S. Li, J. Moss, & C. S. Yuan. "Safety and tolerability of Ganoderma lucidum in healthy subjects: a double-blind randomized placebo-controlled trial." The American Journal of Chinese Medicine 35, no. 3 (2007): 407-14. doi: 10.1142/s0192415x07004928. Xiao, G. L., F. Y. Liu, & Z. H. Chen. "Clinical observation on treatment of Russula subnigricans poisoning patients by Ganoderma lucidum decoction." Zhongguo Zhong-Xiyi Jiehe Zazhi 23, no. 4 (2003): 278-280. Xu, T., R. B. Beelman, & J. D. Lambert. "The cancer preventive effects of edible mushrooms." Anti-Cancer Agents in Medicinal Chemistry 12, no. 10 (2012): 1255-1263. Yoshimura, K., T. Kamoto, O. Ogawa, S. Matsui, N. Tsuchiya, H. Tada, K. Murata, K. Yoshimura, T. Habuchi, & M. Fukushima. "Medical mushrooms used for biochemical failure after radical treatment for prostate cancer: An open-label study." International Journal of Urology 17, no. 6 (2010): 548-554. doi: 10.1111/j.1442-2042.2010.02528.x. Zhang, Y., Z. Lin, Y. Hu, & F. Wang. "Effect of Ganoderma lucidum capsules on T lymphocyte subsets in football players on "living high-training low." British Journal of Sports Medicine 42, no. 10 (2008): 819-22. doi: 10.1136/bjsm.2007.038620. Zhao, H., Q. Zhang, L. Zhao, X. Huang, J. Wang, & X. Kang. "Spore powder of Ganoderma lucidum improves cancer-related fatigue in breast cancer patients undergoing endocrine therapy: A pilot clinical trial." Evidence-Based Complementary and Alternative Medicine (2012). doi: 10.1155/2012/809614. Zhong, Y., Y. Deng, Y. Chen, P. Y. Chuang, & J. C. He. "Therapeutic use of traditional Chinese herbal medications for chronic kidney diseases." Kidney International 84, no. 6 (2013): 1108-1118. doi: 10.1038/ki.2013.276.